Final show of the season! Join Disposable Improv, our most experienced house team, at Clancy's for a night of laughs created from audience suggestions! We've been making NW Indiana laugh for over 9 years and every show is different and every show is a great time. Alcohol available inside show. Tickets are ONLY $10. Show starts at 8 pm. Doors open at 7:30 pm Cash bar. 21+ venue. 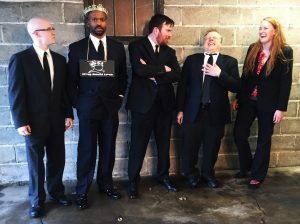 Join Disposable Theatre Improv Ensemble for a night of fun at The Second City, Chicago on Sun Jan 20, 2019--8 PM! Tickets available approximately 2 weeks before the show at The Second City Box Office, or online and tickets will be available day of show. Check back soon for link to show. Improve your object work skills to help set a scene, clearly define a space, natural movements, not dropping the ball (literally), observational skills with this workshop designed for all stage performers but particularly improv. 9 Bad Basses Splash into Clancy’s! Disposable Theatre Improv Comes to Clancy’s! 6 week, 2 hour classes Sundays 4-6 pm. March 10-April 14 Learn improv basics in this six week course combined course open to new students as well as students who have taken DT's 101 class previously. You will also learn some great improv games, work on two- and three-person scenes, and long-form. There will also be a mini skills show for those interested at the end of the session. Disposable Theatre takes the stage at the Little Theatre in LaPorte to entertain with rough-spun comedy gold! No two shows are alike, and this time, it's for charity! 21+ R rated comedy and full cash bar provided by Ogles. A perfect end-of-winter, cabin-fever date night, night out with friends, coworkers, or even nemeses you want to keep eyes on. Click HERE to purchase tickets!